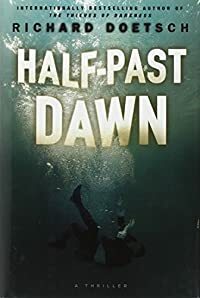 Half-Past Dawn by Richard Doetsch: Synopsis and Online Purchase Options. Synopsis (from the publisher): Jack Keeler wakes up one bright June morning to the shock of his life. He gazes in the mirror and sees a half-healed gash over his right eye and a hastily stitched-together wound in his shoulder that looks suspiciously like the result of a bullet. He also notices an intricately designed tattoo—words written in a foreign script—covering the length of his forearm. He's alone, his house eerily silent without the delightful chatter of his wife and two daughters. He has absolutely no memory of how, when, or why he ended up in such gruesome physical condition. Jack gropes his way down to the kitchen to call his wife, Mia—an FBI agent—and to find some answers. But before he can pick up the phone, his eyes are drawn to the front page of that morning's paper. He takes in a large photo of a bridge, the guard rail missing, a skein of tire marks on the roadway. Above the photo, in large black type, a headline that simply reads NEW YORK CITY DISTRICT ATTORNEY JACK KEELER DEAD. From this mind-shattering opening scene, Richard Doetsch takes readers on a twisting, turning adventure as Jack struggles to find out not only what happened to him, but to his missing wife. As fragments of his memory return, and with the help of a loyal friend, he reconstructs the events of the previous night, which culminated in his being shot and Mia's abduction. He has only until dawn of the following day to uncover an ancient mystery hidden in the depths of one of the country's most heavily guarded prisons. Just when Jack thinks he has put all the pieces together and has saved Mia's life, a final twist occurs that changes everything.